In 1994, Team Kunimitsu scored a popular first career victory in the All-Japan GT Championship at Sportsland Sugo. 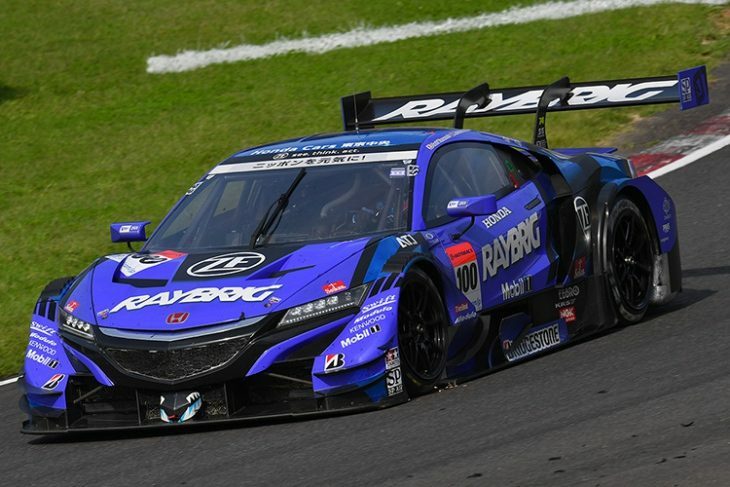 Twenty-four years later, the famous #100 Raybrig Honda NSX-GT drove to another very popular victory at Sugo, in the sixth round of the 2018 Autobacs Super GT Series. Naoki Yamamoto and Jenson Button drove from pole position, and held of strong challenges from the #12 Calsonic Impul Nissan GT-R of Daiki Sasaki and Jann Mardenborough, the #8 ARTA NSX-GT of Takuya Izawa and Tomoki Nojiri, with a final 6-lap Safety Car restart thrown in for good measure, to take their first win of the 2018 season for Team Kunimitsu, a win that puts the duo in a commanding lead in the GT500 Drivers’ Championship with two rounds remaining. Temperatures today were a bit warmer than expected, peaking during the middle of the race at 28°C. After the rain that rolled over the rural woodlands of Miyagi Prefecture on Saturday, a crowd of 28,500 spectators were greeted by sunny skies with just a small amount of cloud cover. Yamamoto started the race from pole position in the #100 Raybrig NSX, with Mardenborough taking the start in the #12 Calsonic GT-R from 2nd, and Izawa starting the #8 ARTA NSX from 3rd. 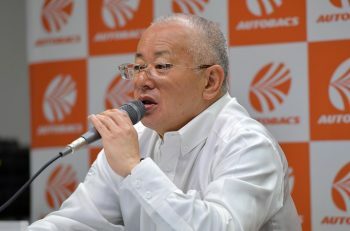 The bright orange Honda of Izawa had more pace at the start of the opening leg of the 81-lap race, and overtook Mardenborough around the outside of the First Corner on Lap 9. While they fought over 2nd, and fought through dense traffic in the process, Yamamoto extended his lead over the field. But within 10 laps, Mardenborough was able to claw back to within striking distance of Izawa, and with an astonishing and opportunistic move in traffic, the Welshman re-passed for 2nd through Rainbow Corner – and then went to work on chasing down Yamamoto in the lead, who soon lost a huge chunk of time in traffic himself! 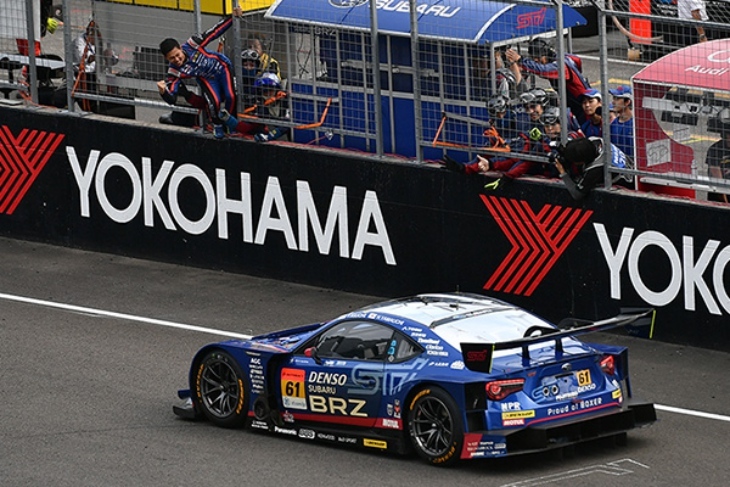 A six-second lead was suddenly trimmed down to under two seconds over the span of two laps, and with the Raybrig NSX in his sights, Mardenborough sent the Calsonic GT-R to the lead on Lap 23, with another pass on the inside of the First Corner. It was now clear that these two blue cars would be the protagonists for the victory, both looking to end lengthy winless droughts for their teams – Team Kunimitsu hadn’t won since 2015, Calsonic Team Impul winless since 2016. The Raybrig NSX was first to pit on Lap 34, hoping to do the undercut on the Calsonic GT-R. Jenson Button jumped into the car, while Mardenborough cycled to the lead and ran four more laps out front until he pitted on Lap 38. Daiki Sasaki then climbed aboard the Calsonic GT-R for the final stint. With Button’s Bridgestone tyres up to temperature and Sasaki coming out ahead on cold tyres, Button was able to pass Sasaki with ease on the outlap. At the halfway mark of the race, the Raybrig NSX led the Calsonic GT-R, but while Sasaki was giving chase, he ran wide through the grass at the exit of the tricky 110R corner on Lap 46. This cost him six seconds to Button in the short term. But long-term issues with overheating, caused by large chunks of grass being caught in the front grille, would ultimately be the death knell of their chances of winning. Within 10 laps, Tomoki Nojiri, now aboard the ARTA NSX, had closed in – and passed Sasaki with relative ease on Lap 57. This now made it a Honda 1-2, with Button now leading by nearly 15 seconds. The situation was starting to become dire at Calsonic Team Impul. 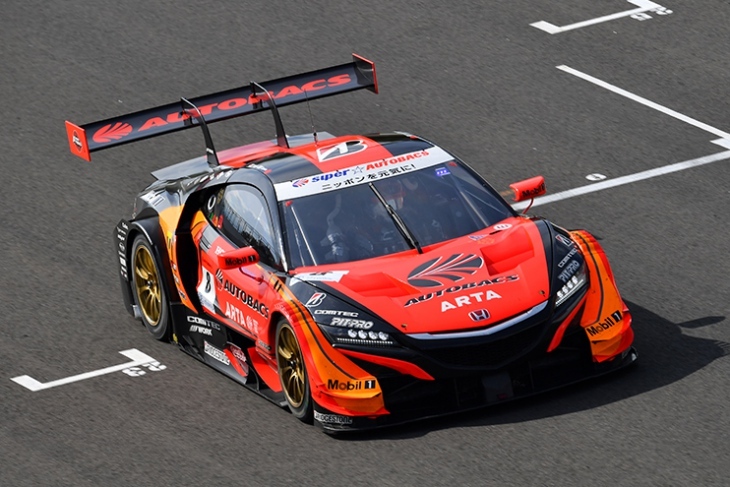 On the same lap, Button was forced wide while trying to overtake GT300 traffic at the 110R and he too ran through the grass, not as dramatically as Sasaki did, but enough to give cause for alarm as they too had a bit of turf caught in the grille of their NSX. Still, they led by over 10 seconds. But on Lap 67, the #31 Toyota Prius apr GT of Kohei Hirate crashed at SP-In Corner, burying the car into the sponge barriers. The cars raced on for a few laps, but as it became apparent that more intervention was needed to extract the Prius safely, the Safety Car was deployed with ten laps to go, erasing all of Button’s lead. The worries about the Raybrig NSX overheating dissipated when the field took the restart with six laps to go. Button and Nojiri got past the lapped #1 KeePer TOM’s Lexus LC500 of Ryo Hirakawa, which was running well out of the points in 14th. Two laps later, Hirakawa crashed the KeePer LC500 at the Hairpin Curve, sealing the fate of he and Nick Cassidy. A major setback for the championship leaders coming into the race, who went scoreless for the first time after 13 consecutive points-paying finishes. Then, two laps later, Bertrand Baguette in the #64 Epson Modulo NSX-GT went off into the barriers at the exit of 110R. No Safety Car was deployed, but Super GT’s First Rescue Operation (FRO) vehicles and Sugo course vehicles were on track driving to their aid. Button and Nojiri ran tail-to-nose on the Final Lap, and a bizarre scene unfolded ahead of them as both drivers caught up to the back of one of the Toyota Prius course vehicles at the S-Curves! In a bizarre and dangerous situation, the two Hondas escaped what could have been a catastrophic scene and drove away in order. And all Jenson Button had to do was drive the final 3.7 kilometers to take the victory for him, for Yamamoto, and for Team Kunimitsu, their first win since the Sugo race in September 2015. Button took in the joy of his first racing victory since the 2012 Formula 1 Brazilian Grand Prix, and, of course, his first career Super GT victory, his first victory after the transition from F1 to sports cars. “Things went well in the early stages of the race, but part way through the track temperature rose and the soft tires I was racing on began to lose performance,” said Yamamoto. “But I was able to hold on somehow and pass the baton on to J.B. He went out to the track on the medium compound tires, but then the track temperature began to drop and make it hard for him. It was a really tough race but the perfect pit work of the team saw us through. I’m really grateful to everyone.” This is Yamamoto’s fourth career GT500 victory, his first since Sugo 2015. With the victory, the championship picture in GT500 is drastically overhauled. Button and Yamamoto, on 61 points with their win from pole position, now lead Nojiri & Izawa, who jump up to 2nd on 49 points as they finished 2nd in the race by just 0.562 seconds. 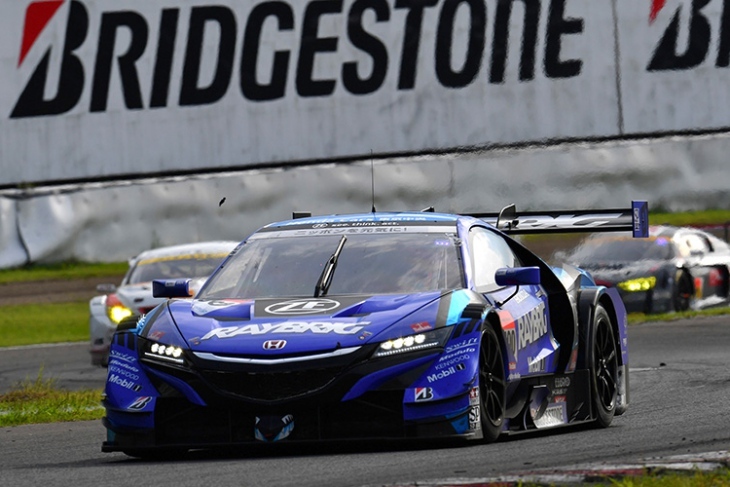 For the third time in 2018, Hondas finish 1-2 in GT500, this after receiving a 10 kilogram minimum weight increase for the weekend, and despite both the winning cars carrying the “Level 2” fuel-flow restrictors as part of their Success Ballast this weekend. And after the overheating scare through the end portion of the race, the #12 Calsonic Impul GT-R of Sasaki and Mardenborough still held onto third place, the Safety Car intervention actually helping them in some regards as they picked up their first podium since 2016 – and the first premier class podium for Mardenborough, previously a winner in the GT300 class. The #16 Motul Mugen NSX-GT (Hideki Mutoh/Daisuke Nakajima) made a late lunge to take 4th position, Team Mugen’s best result since their comeback to the GT500 class last season. In 5th was the #38 ZENT Cerumo LC500 (Yuji Tachikawa/Hiroaki Ishiura), followed by a trio of Nissan GT-Rs led by the #24 Forum Engineering Advan GT-R (João Paulo de Oliveira/Mitsunori Takaboshi) in sixth, the #23 Motul Autech GT-R (Tsugio Matsuda/Ronnie Quintarelli) in seventh, and the #3 CraftSports Motul GT-R (Satoshi Motoyama/Katsumasa Chiyo) in eighth. The #6 Wako’s 4CR LC500 (Kazuya Oshima/Felix Rosenqvist) was 9th on the road, but Oshima picked up a post-race time penalty for dangerous driving that demoted them to 11th. Thus, the #17 Keihin NSX-GT (Koudai Tsukakoshi/Takashi Kogure) moved into 9th, and the #39 Denso Kobelco SARD LC500 (Heikki Kovalainen/Kamui Kobayashi) took 10th. Behind Button/Yamamoto in 1st and Nojiri/Izawa in 2nd, Hirakawa & Cassidy now fall to 3rd in the championship with a 14 point deficit. Tsukakoshi & Kogure are 4th, 21 points back, tied with Yuhi Sekiguchi in 5th. 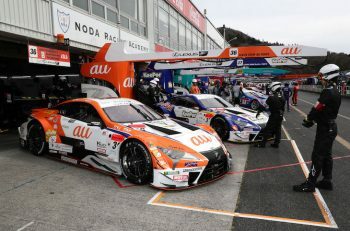 Sekiguchi was given a late drive-through penalty for dangerous driving, which demoted he and Kazuki Nakajima in the #36 au TOM’s LC500 to 12th place. 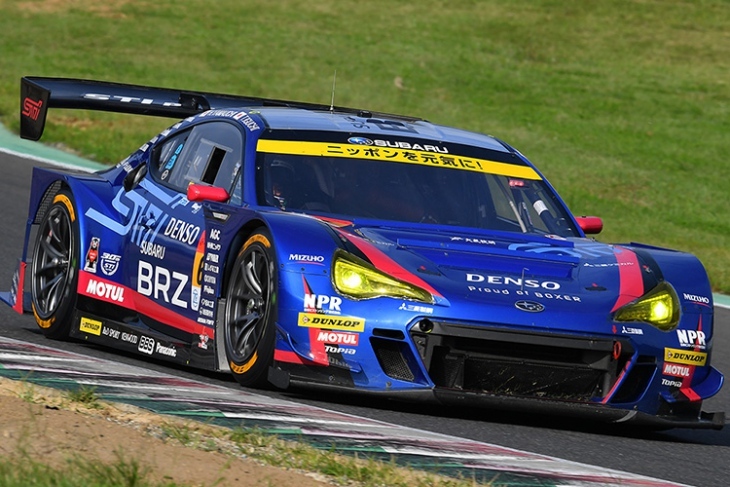 In the GT300 class, the #61 Subaru BRZ R&D Sport of Takuto Iguchi and Hideki Yamauchi capped off a dominant weekend, leading Saturday practice, both phases of qualifying, the Sunday morning warm-up, and taking a commanding victory after 76 laps. Only during the pit stop cycle did they relinquish their lead, with Yamauchi driving away from the pack during his 31-lap opening stint, and Iguchi picking up the lead again on Lap 52 with 15 seconds in hand. But with the safety car for the #31 Toyota Prius’ crash on the 60th lap, their lead was neutralized. When the race restarted, however, Iguchi quickly checked out from the field and ended up winning by 6.302 seconds. For Iguchi, it was his fifth career GT300 win. For Yamauchi, it was his second. And for Subaru and R&D Sport, their first win since the 2016 Suzuka 1000km, and a massive relief to everyone in the programme after suffering through poor reliability throughout most of 2018. This win is the first for a JAF-GT300 category car in 2018. Finishing 2nd was the #10 Gainer TanaX triple a Nissan GT-R NISMO GT3 of Kazuki Hoshino & Hiroki Yoshida, their best result of the season. This was Yoshida’s first podium since the 2012 Suzuka 1000km – but that was a race in which Yoshida didn’t actually drive, so this was the first time he drove to and stood on a GT300 podium in his career. For Hoshino, its his first podium since 2016. 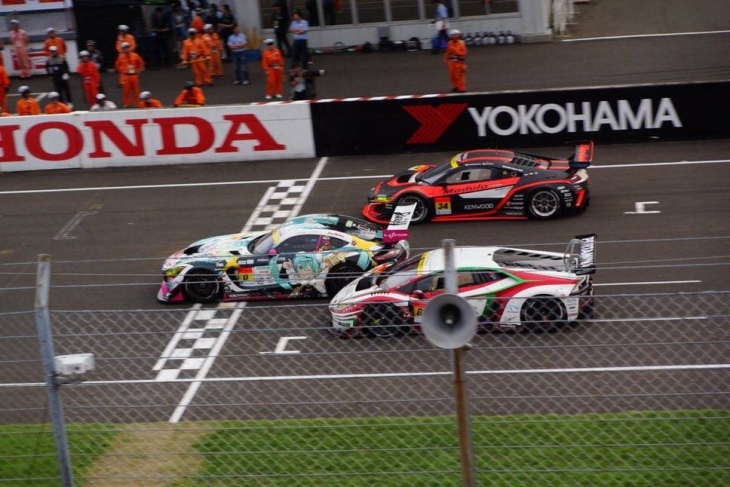 But the real drama in GT300 came down to a three-wide finish at the line for third place! The #0 Goodsmile Hatsune Miku AMG (Nobuteru Taniguchi/Tatsuya Kataoka) pitted early and only changed rear tyres on their stop., The #88 ManePa Lamborghini Huracán GT3 (Kazuki Hiramine/Marco Mapelli), which had started 17th, had charged up to 4th, and Mapelli on four fresh tyres was closing in by over a second per lap to Taniguchi in the Miku AMG. The Safety Car gave Taniguchi a reprieve, but the three-time and reigning champion was still struggling for rear tyre grip. As they battled it out for third place, a stunning development happened behind them: The #34 Modulo Kenwood NSX GT3 (Ryo Michigami/Hiroki Otsu) was 11th when the Safety Car was deployed. In the final six laps, the rookie Otsu charged his way through the pack, and was right on the back of both Taniguchi and Mapelli in the final run through 110R! Taniguchi held his line, Mapelli looked to the outside, and Otsu dived to the inside at the line, and Taniguchi held on to third place by just 0.057 seconds at the line – with Otsu snatching fourth place by just 0.008 seconds in a stellar finish! It was a critical third-place finish for Taniguchi and Kataoka, their second straight podium of the season, and one that moves them into 3rd in the championship with a 7 point gap to points leaders Shinichi Takagi and Sean Walkinshaw in the #55 ARTA BMW M6 GT3. For Michigami and Otsu, this was redemption for their bizarre and premature end to the weekend at the Fuji 500 Miles, and the best-ever finish for the Honda NSX GT3 in Super GT – the best result for Modulo Drago Corse since their GT300 return. The #88 ManePa Huracán can still enjoy a great day where they picked up 12 places in another hard-charging effort. Finishing 6th was the #9 Gulf NAC Porsche 911 GT3-R (Rintaro Kubo/Keishi Ishikawa), their first top-10 finish of 2018. It would have been the #87 Legal Frontier Lamborghini GT3 (Kimiya Sato/Yuya Motojima) behind them in 7th, but they also picked up a post-race time penalty that demoted them to 13th. That moved the #52 Saitama Toyopet GreenBrave Toyota Mark X MC of Taku Bamba and Shigekazu Wakisaka from 8th to 7th, either way, the first-ever Super GT top-10 finish for the team since their Super GT debut! With the penalty, the #65 LEON Cvstos AMG (Haruki Kurosawa/Naoya Gamou) moves up to 8th, the #60 Syntium LM Corsa Lexus RC F GT3 (Hiroki Yoshimoto/Ritomo Miyata) finishes 9th, and after starting 23rd, the #55 ARTA M6 of Takagi & Walkinshaw picks up a 10th place finish. Takagi and Walkinshaw, astonishingly, increase their points lead from 6 to 7 points in the GT300 championship. Koki Saga and Kohei Hirate crashed out, preventing them from making any ground – and they now sit level at 45 points with Taniguchi & Kataoka. Kurosawa & Gamou slip to 4th at 42 points. The #11 Gainer TanaX GT-R (Katsuyuki Hiranaka/Hironobu Yasuda), which had to serve an emergency pit stop with 10 laps to go, remain at 37 points. The #25 Hoppy Toyota 86 MC (Takamitsu Matsui/Sho Tsuboi) suffered a suspension failure and remain at 35 points. And now, with their win today, Iguchi and Yamauchi move up to 7th at 32 points. For the weekend, 41,400 spectators turned out over two days, the largest reported crowd at Sugo since 2008. And what a show they were given, one that saw high drama for the win in the premier class, and the groundwork laid for a frantic dash to the championships in the last two rounds. The next race will be the Super GT in Kyushu 300km at Autopolis circuit, on 20-21 October.